Crocodilia is taxonomic order of reptiles, which includes both the alligators and crocodiles. There are 3 families in Crocodilia with 23 species total. The members of Crocodilia are living fossils, which according to evolutionists date back to the time of the Mesozoic (245-65 million years ago) along with the dinosaurs. It is believed they dominated life on all continents and in the oceans during this geologic age. Although they live all over the world, their behaviors are similar. 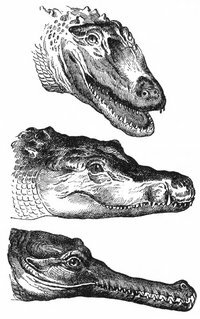 All crocodilians have a similar appearance, with a head held horizontally in front of the body, four legs which project from the sides, heavy scales which function as armor, and a heavy muscular tail. Their eyes are on the top of their heads and close together to allow for binocular vision. Their skin is covered with non-overlapping scales composed of the protein keratin and often studded with bony plates called scutes. (Lizard scales are similar, but lack the bony plates.) The scales are shed individually, so crocodilians do not molt like snakes do. This skin does not provide much insulation, preventing crocodilians from inhabiting cooler climates. Crocodilians' hearts have four chambers like mammals and birds, but there is a pore between the left and right ventricles which allows some mixing. The snout of crocodilia is typically used to distinguish crocodiles and alligators. Alligators have thinner mouths than crocodiles. They reproduce sexually. 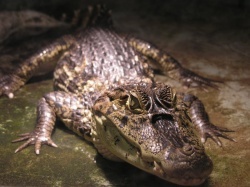 All crocodilians lay eggs in nests and the female crocodilians protect their eggs. All eggs in a nest hatch at the same time. 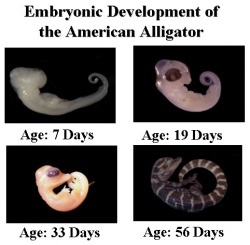 Temperature dictates the gender of the unborn crocodilians. If the eggs hatch at a temperature that over 30˚C, they will be males, and if under 30˚C, they will be females. All modern crocodilians have adapted to a semi-aquatic life. They usually eat only about 50 full meals a year. Crocodilians are opportunistic hunters; they catch and eat only when they are hungry. They are capable of catching flying prey as well. The big difference between crocodiles and alligators is where they live. Alligators live in the Americas and crocodiles live throughout the tropics of Africa, Asia, and Australia. This page was last modified on 27 July 2014, at 16:50.